Awful sorry, dreamers! This was a whole week late! Elae Meltaea has all kinds of magic all over the place and each society views it with varying degrees of want. While most mages are limited to basic gramarye, which allows basic stuff like fireballs or magic shields but has a multitude of limitations, witchery allows the invoking of greater powers such as natural energies, words of power, or sympathetic magic to do stuff that normal gramarye can't such as summon the dead, turn people into frogs, or force folks to do things they don't really want to. Despite its wide variety of altruistic applications, witchery is consistently as despised in Elysia as it was on Earth, even by other mages. Charlotte (aka Carlie) and Rosette are the lead guitarist and vocalist respectively of Blöody Wÿtchcraft, a "girl-metal" band formed to hide that its members are all witches by openly claiming it so that everyone thinks it's a publicity stunt. Kuties in Satan's Service. Charlotte is the older of the two and attractive in her own right, but jealous of her younger sister's slightly taller height, ample figure, and generally endearing presence. While a witch nominally, Carlie isn't any good at hexes 'n' crap, relying on more typical gramarye to solve her problems with colossal firestorms. Rosette in contrast is shy, elegant, and ironically very quiet off-stage. She lacks the nerve to sling fire and brimstone about as Carlie is wont to do, and prefers to use her witchery for practical tasks like house chores. Both sisters utilize their respective instruments as their broomsticks. 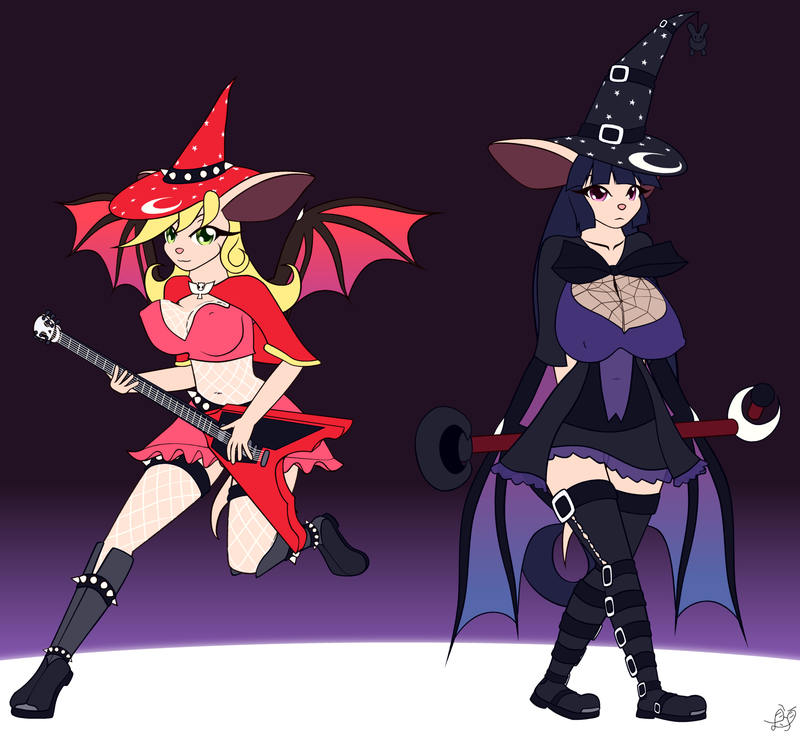 Carlie's guitar allows her to spread her spell across the considerable area its sound reaches at the cost of weakening the effect, while Rosette's microphone allows her to enthrall and command en masse weaker-minded creatures similarly to a siren. Due to their interest in living they usually do not exercise either power during a concert, though Carlie's would be easier to handwave. There's another common witch trope that I've snuck into the image, if anyone figures it out!